Leave it to the beautiful Xandra Rocha to go fruit shopping while looking incredibly chic. 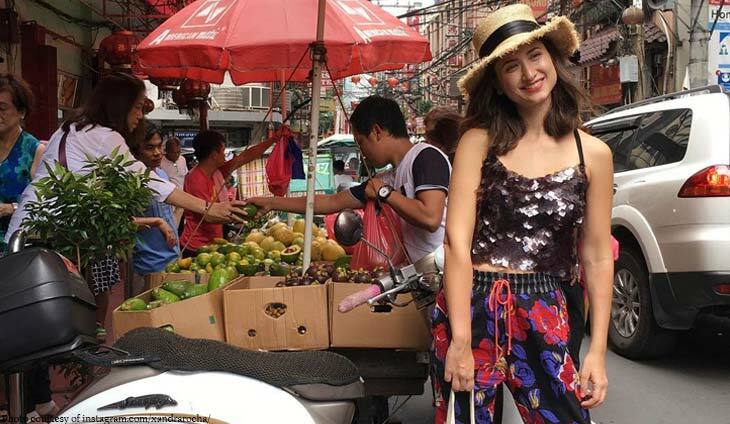 Wearing a sequin top, palazzo pants, and platform shoes, the wife of Luis Marcos Araneta happily posed beside a fruit stall vendor after successfully negotiating a better price. ““Dalawang kilo ng avocado, isang kilo ng mangosteen, at isang kilo ng lanzones please. Taga dito po ako ha! Bigyan mo naman ako ng presyong suki!” The usual spiel. Not the usual outfit.😜,” said @xandrarocha. Looking for cute swimwear that is eco-friendly and stylish too? The wife of Luis Marcos Araneta shares some of her food stories. It’s of course in the arms of her hubby Luis Marcos Araneta.